With over 300 sunny days every year, Rockhampton plays host to numerous outdoor activities. 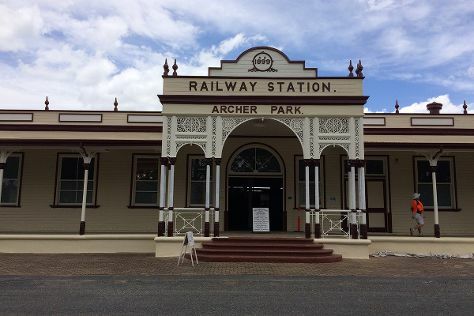 Satisfy your inner culture vulture at Archer Park Rail Museum and Mount Morgan Historical Museum. Rockhampton Art Gallery and Rockhampton Heritage Village will appeal to museum buffs. Explore Rockhampton's surroundings by going to Yeppoon (Wreck Point Scenic Lookout, Shell World Yeppoon, & more), Gladstone (Auckland Hill Lookout, East Shores Water Park, & more) and Emu Park (Singing Ship, Anzac Plaza Emu Park, & more). Spend the 19th (Mon) exploring nature at Eubenangee Swamp National Park. Spend the 24th (Sat) exploring nature at Mount Jim Crow National Park. And it doesn't end there: stroll through Mt Hay Gemstone Tourist Park, contemplate the waterfront views at Stony Creek, explore the striking landscape at Five Rocks, and admire the engineering at "Big" Mount Morgan Dam. To find maps, reviews, photos, and tourist information, use the Rockhampton travel route planner. In August in Rockhampton, expect temperatures between 30°C during the day and 13°C at night. Cap off your sightseeing on the 29th (Thu) early enough to travel back home.